We network with others to respond to Christ's call to make visible: values of human dignity, freedom, and justice among all peoples, especially the powerless and those made poor. We work in partnership with other religious communities and professional organizations. Founded in 1956, the Leadership Conference of Women Religious (LCWR) is the association of the leaders of congregations of Catholic women religious in the United States. A conference of more than 1500 members, LCWR represents more than 90 percent of the 59,000 women religious in the United States. The conference assists its members in carrying out their service of leadership and serves as a resource to its members and to the public. Visit www.lcwr.org to learn more. Communicators for Women Religious (formerly the National Communicators Network for Women Religious) is a professional organization of personnel responsible for communications within religious congregations of women. Its mission is to be a network of professional support and education for members who promote understanding of women religious, enhance their image and advance their mission. CWR is also a resource for organizations serving women religious. Visit www.c4wr.org for more information. Catholic Sisters of the Upper Mississippi River Valley, formerly Sisters United News (SUN), promotes and publicizes the values of Catholic sisters living the Gospel in today's world: seeking God together in prayer and spirituality, embracing community, living in right relationship with all of creation and working for peace through justice. The influence of women religious congregations in the Upper Mississippi Valley is enhanced through participation in this organization. Visit www.facebook.com/catholicsisters to learn more. Dubuque Area Vocation Association (DAVA) is comprised of vocation ministers who support one another through faith-sharing, programming and resourcing. They collaboratively promote religious life and priesthood. These vocation ministers work together as servant leaders, centered in Gospel values. 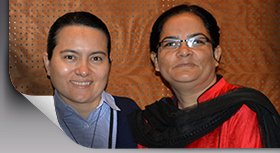 The North American Conference of Associates and Religious (NACAR) is a membership organization that acts as a catalyst to serve, empower and promote the associate-religious relationship.